This is one Christmas make I can now cross off the list. Tree decorations using book pages. I've experimented with many different ideas. My honeycomb ornaments were a complete dis-as-ter, glue everywhere! 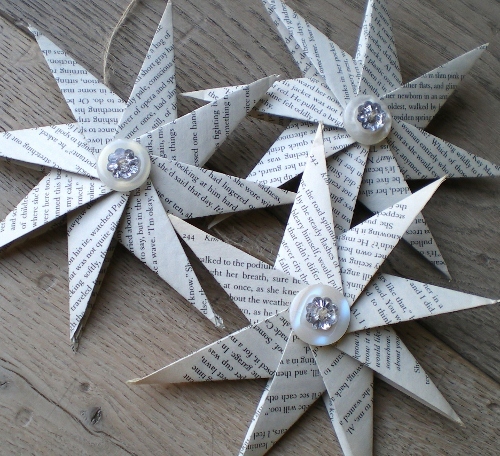 No glue involved in making these stars, just lots and lots of folding. The tutorial to make them is HERE it's a Norweigan blog , but the pictures are very clear and easy to follow . I cracked it after a few attempts. To finish them off I added some pearl and sparkly buttons and natural button twine for attaching them to the tree. 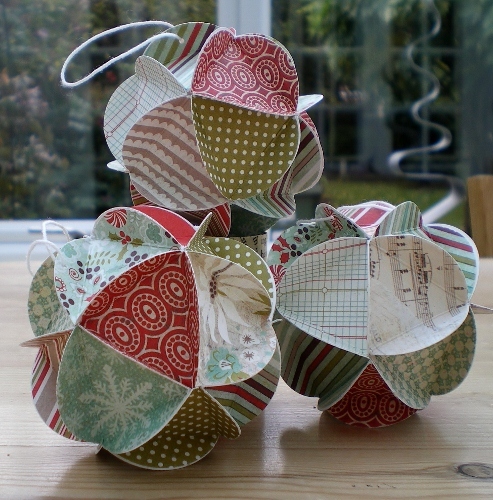 Right, I'm back today as promised with how to make the Christmas baubles from my last post. First, and most importantly, you need a good quality patterned paper otherwise the baubles will be too flimsy and difficult to construct. Then you need a circle punch, die or a circular object to draw around (the circle punch I used is 1 1/2 ") some PVA glue and a scoring board/bone folder. 1. 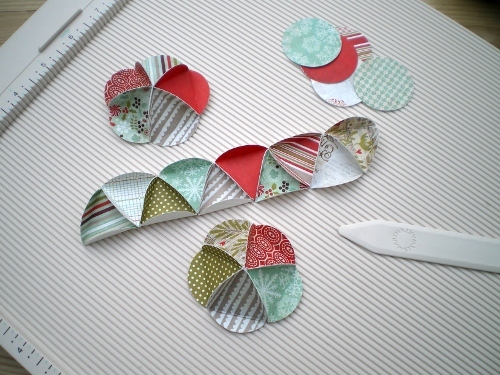 Punch or die cut 21 circles for each bauble. 2. Take one of the circles and draw an equilateral triangle on the reverse and cut it out. Use this triangle as a template for marking the score lines on each circle. 3. 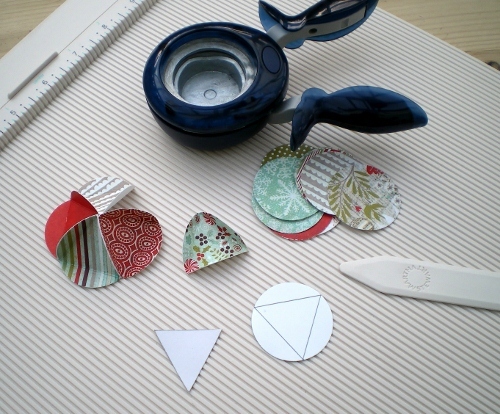 Take the template and lightly mark with a pencil the 3 points of the triangle on the reverse of each punched circle. 4. Use these pencil marks as a guide to score a triangle on each circle. 5. Join 5 triangles together for the top and bottom. I found wet glue worked best as it gives you a bit of wiggle room as you line up each edge. 6. Join 10 triangles together to form a strip for the centre section. Join the ends of this strip together, forming a ring. 7. Now stick the top and bottom to the centre ring to complete the bauble. 8. 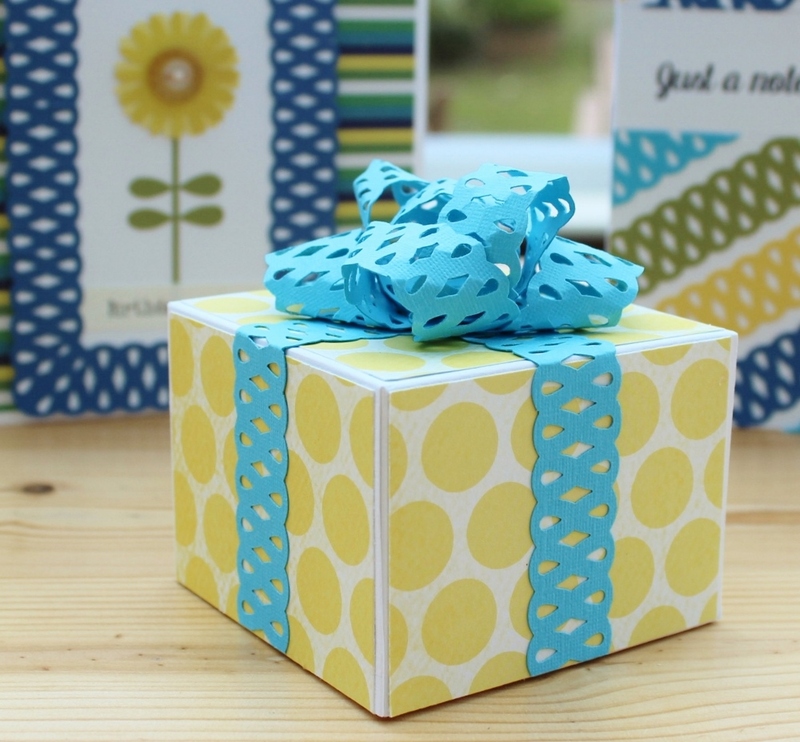 Create a hanger by punching a small hole in one of the edges and thread with cotton or twine. I think that covers everything! Any questions, just leave me a comment. Have you started getting ready for Christmas yet? 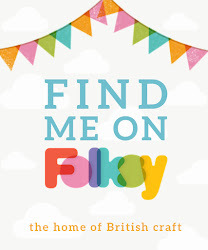 Our new challenge over on the Let's Craft and Create blog is the perfect place to start because that's our theme Getting Ready for Christmas. 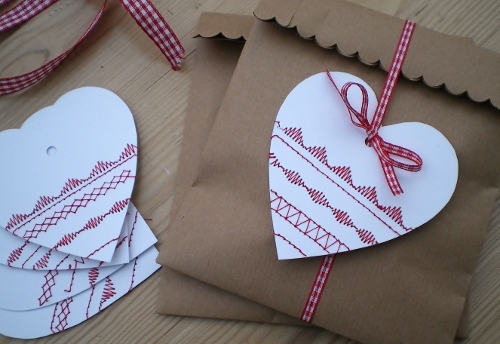 You'll find loads of inspiration for those Christmas makes over on the blog. All you have to do to enter is post a photo of what you're making in preparation for the big day, couldn't be simpler! I thought I'd taken the pressure off this year by buying most of my cards. But now I've got it into my head, thanks to the Cosmo Cricket blog, to make all the tree decorations by hand. 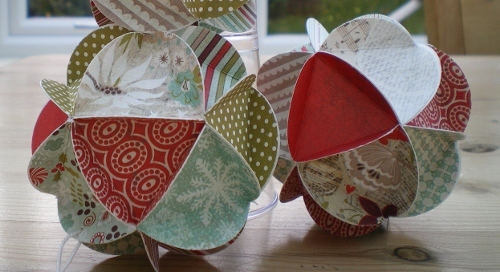 These baubles, although a bit tricky to start with, get easier the more you make! Took one whole evening to make the first but I've got a system now. Ideal to make with one eye on the TV! I'll be back with a tutorial showing you how to make them tomorrow. 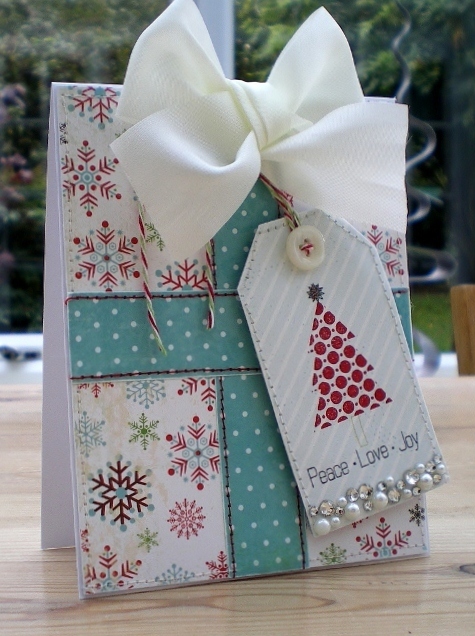 Here we go with the first of this year's Christmas makes, it's for the November Card Challenge over on The Ribbon Girl Blog - Add Some Sparkle. 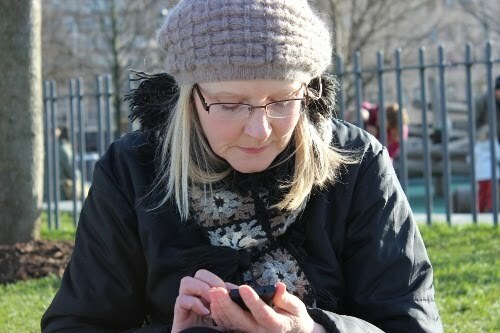 Don't know why (although I could hazard a guess!) I've been struggling to get any inspiration for Christmas crafting this year. But, this stamp set from the new stamp company Clearly Besotted has really helped get me started. 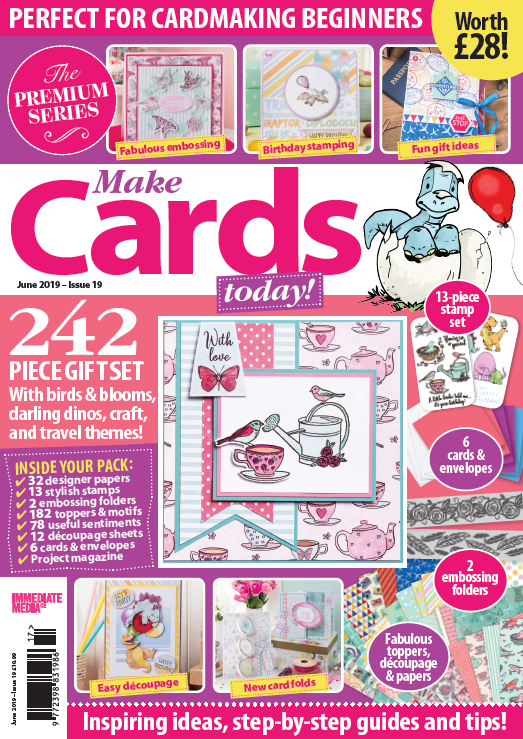 Together with all the gorgeous new products in The Ribbon Girl store of course. Check out The Ribbon Girl Blog for all the challenge details and beautiful cards from my team mates. The prizes include 2 £10 vouchers to spend in the store - you'll be surprised at how much ribbon and sparkle you can buy for £10! Hope you can join us.